Ninety million subscribers are to benefit from reviewed lottery services provided by telecommunications operators. 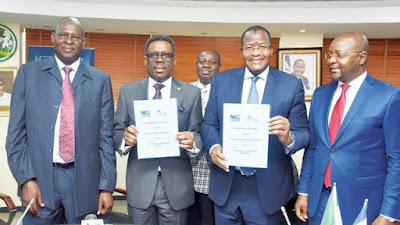 The new regime was birthed by yesterday’s signing of a robust memorandum of understanding (MOU) by the Nigerian Communications Commission (NCC) and National Lottery Regulatory Commission (NLRC). During the event at the NCC headquarters in Abuja, its Executive Vice Chairman/chief executive, Prof. Umar Danbatta, said the whole idea was to provide the right environment and facilities for the lottery commission to do its job better. Under the new arrangement, the NCC could withdraw its approval whenever the lottery body revokes the permit of a service provider. According to the NCC boss, the reworked pact was to accommodate trends in the lottery industry and streamline strategies needed to ensure the smooth implementation of the agreement. Noting that the current development was a win-win situation for the commission, NLRC, government and consumers, he stated that the agreement is in tune with NCC’s strategic partnership agenda. He said: “Lotteries all over the world are now electronically-driven and there is no better infrastructure that is available in this country than telecommunications. “As you are aware, bringing any additional service on the infrastructure adds more burden to the networks. Therefore, the commission is concerned that any more work could or may degrade quality of service. The Acting Director General of NLRC, Lanre Gbajabiamila, said the collaboration was to boost operations, integrity and accountability in the lottery industry. He maintained that due to technological advancement, it was important that the commission entered into pacts with other agencies to regulate practice more efficiently. ‘’The agency cannot do it all alone. The industry has advanced and it is now technology-driven. That is why the commission has a platform where all the operators are connected to our system so that we can monitor transactions and what is being distributed to actual winners,’’ he added.